Turf | Buy loose topsoil and turf online at Topsoilshop. Turf is cut fresh to order and delivered on an over night service! We are a premium turf supplier, we deliver rolls of turf between Tuesday and Saturday. Choose from our range of quality grown lawn turf, we sell our turf in rolls which will cover 1m2 (60cm wide by 1.7m long). All of our types of turf grass can be seen in the product section, so you can choose the perfect garden turf supplies to make your garden look stunning. Garden turf can transfrom your garden into a vibrant, enjoyable place to be, see our selection of garden turf to choose the right kind for your garden. Our excellent range of turf for sale includes family lawn turf that is hardwearing and will still look great after the kids have played on it, to deluxe lawn turf that is perfect for a show garden as it creates a bright, thick and lush lawn to show off your skills. Buying turf has never been easier with our turf calculator, and you can view our guide on how to lay turf in the blog section to ensure that your lawn looks amazing and that the turf is laid well. 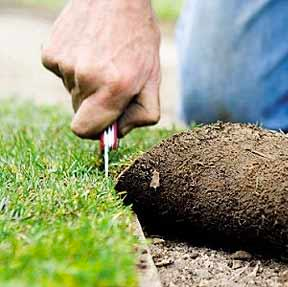 Simply select the grade of turf you require and then choose which pack size you require to turf your garden. You may want to add a little extra for cutting etc, if you are unsure of how much to turf a garden then you can call us for advice. We can advise you on the best time of the year to lay turf and how to lay garden turf if you are struggling, simply contact us today for help and advice on how to make your grass turf a perfect fit!